I’ve thought about writing an article on this topic for a while now, but I’ve held back. There are several reasons for that fact. The first is that I do not consider myself a health or fitness professional. I have been overweight my entire life. That’s just a fact. I have also had a very unhealthy relationship with food and a very negative outlook on going to the gym or working out. Yet over the past few months, a lot of that has changed. Sure, I am still not a professional, and I am still overweight for my age and height, BUT I am working towards getting better. Something I’ve come to really appreciate about working on my health is that, despite not being a professional, it has inspired many people around me to do the same. That’s incredibly awesome. I still have work to do, but I thought I’d share my story so far here, in hopes that maybe I can inspire even one more person to start loving themselves a little more. If I can do that, than the time spent putting this little article together will be well worth it! Meet Jaysen in January of this year as I arrived in Florida and first laid eyes on my new store in Disney Springs. In January, I weighed around my heaviest as an adult, 225 pounds. In the summer of 2016, I had almost gotten to a good place with my health, but I gave into stress and gave up, going back to my old ways of eating poorly, not exercising and being depressed about the state of a world I felt powerless to change. On my birthday this year, I weighed the most I have weighed as an adult. And though my hoodie hides it well, I was obese, tired from walking up stairs and feeling completely self conscious in my own skin. At this point, my weight was still a mess, but I was starting to realize that maybe I could change that. After all, I was in a new place with a new job, and life seemed to be a lot happier than before. After all, we were going to Disney constantly and I was finding lots of reasons to smile again! I want to talk about my Mom for a moment here, because it was actually her health which caused us both to make a change. I’m going to tell her story a bit, and I really hope she doesn’t mind because to me, it is even more inspiring. As you can guess, my Mom has also struggled with her weight all her life. It runs in the family. Here is Mom and I February of 2016. In April of this year, My Mom was rushed to the hospital, unable to breathe. As it turned out, she had blood clots in her lungs which created a high risk of fatality. While in the hospital, tests were run and she found out that she was diabetic, something else that runs in our family. It was time to make a change. On the phone one night, I told my Mom she had to take care of herself and get better, and so did I. If Mom was going to make a life change, I was going to do it with her. She would be working to correct a family illness. I would be working to avoid a family illness in a future that I was laying out by not taking care of my body. We headed into the months that followed. While I can’t speak for my Mom, I can speak to my experience that I did not do everything right from the start, but I made it my duty to learn constantly and to always be open to new ideas. While I won’t be documenting EVERYTHING in this single post, I will be covering a broad range of the changes I made. Over the past few months, I’ve been asked a lot what PLAN I’m on, both from a diet perspective and from a workout perspective. The truth is, I’m not on a plan. When learning how to eat right, I took the approach of learning more about my food. I wanted to know more about what I was putting into my body and why it was layering on the pounds. One big help in this and something I recommend constantly is the My Fitness Pal app, which is free to download. This allows you to easily track what you are eating, your steps and your exercise. It also tracks your weight, as long as you enter it, and helps you celebrate milestones along the way. Google how to lose weight, and most lists of things to change will tell you to write down everything you eat. This is very similar to that idea, and it works! Yes, you’re keeping track of calories so you don’t over eat, BUT you’re also seeing exactly what your eating and what affect it has on your nutrition. One example I love to share is that when I first started this process in April, I was eating A LOT of fruit. I love fruit! And fruit is healthy…right? Well, yes, BUT there is such a thing as too much. Some researching determined that I should be intaking about 37 grams of sugar a day. Due to the amount of fruit I was eating, I was intaking anywhere from 65 to 80 grams a day. Yikes! This allowed my to pull back on the sugar in smart ways. For example, dropping my morning banana and/or apple, for a lower sugar option instead. My first plateau came at 210 pounds. I was stuck! And so soon! Part of getting past that hump involved cutting my sugar. The other part involved protein. Once again, research told me that I should be eating around 125 grams of protein a day. I was eating around 30-40g. I’m just not a big meat eater. I researched good sources of Protein and added them into my diet. This included things like Shrimp, fish and chicken. I also included sources of protein like why protein mixed with water (Blended to avoid the lumps) as well as Pure Protein Bars. This is my second recommendation. A good friend turned me on to these. Yes, they are high in calories, but you’ll also notice that they have 20 grams of protein and only 2 grams of sugar. That’s the key. 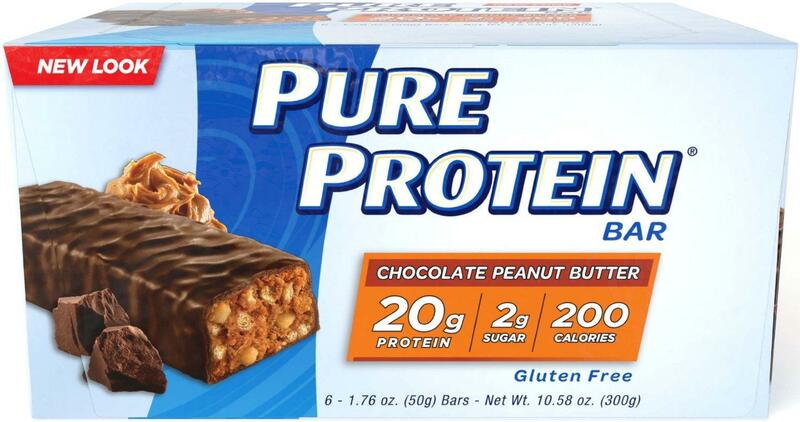 When getting a protein bar, make sure to look for double digit protein and single digit sugar. Knowing this fact, you might notice that your Luna and Kind bars are actually not so friendly after all. More importantly to the sweet tooth that I am, these bars quench the need for something sweet while not breaking the dietary bank. This was the final pillar of breaking past my plateau. Initially, I just wasn’t eating enough. Eating the proper amount of calories, and that is very different depending on your height, weight and gender, is key to losing weight. Starving yourself may get rid of some pounds but your body goes into starvation mode and starts eating away at muscle instead of fat. It’s just not the right way to a healthy life. A big part of making sure I hit my calorie levels everyday involved what has become one of my favorite parts of this process: Meal Prep. If you follow me on any social media platform, you’ll know that I LOVE meal prepping now. In general, I prep both my and my husband’s breakfast and lunch and I do so for a week at a time. When prepping, you want to make sure that you have a clear vision of what you want to do when you hit the grocery store and also stick to making sure the meal has three important things: Vegetable, Protein Starch. And finally, when it comes to diet, anyone who knows me in the real world, knows I can’t pass up an opportunity to shout out what has become essential to me succeeding on the food front, Halo Top Ice Cream. Halo Top is a low sugar, high protein all natural ice cream. one pint has anywhere from 240 calories to 360 calories from what I’ve seen and a serving is about a fourth of that pint. A single serving has single digit sugars and is anywhere from 60 to 80 cal. I mark the side of my pints with a marker so I know when I’ve hit a fourth, making this a perfect way to end the day. Most importantly though, since it is a diet ice cream and those come with a bad rap, is that it is fantastically delicious! I recommend the Birthday Cake, Peanut Putter and Mint Chip flavors, but they’re all awesome! When we moved to Florida, we moved into an apartment that had a gym as an amenity. Of course, just because something is there doesn’t mean you’re going to use it, and for the first couple of months of living here, we didn’t. But when I decided to get my health together, I decided that I gym I could walk to at any hour of the day was an opportunity that I could not pass up if I hoped to make a big change. I started out by simply riding a stationary bike for 30 minutes 3 times a week. Carl helped out by coming to support and climb walls. At first, I HATED working out! HATED IT! It hurt, I felt sore and worst of all, it was SO BORING! I’m someone who likes to be entertained. I knew I had to find a way to motivate myself or this was never going to work. Now I can safely say that what I did will not work for everyone, but it kept me going and that’s what counts, so I think it’s worth sharing. In order to keep myself motivated, I started taking my 3DS to the gym and playing while I rode the bike. No longer was gym time “Boring time.” It was now my time to cozy up to a good story while burning calories. This also helped me get over another issue which was that I hated the idea of people seeing me work out. I know that’s something many people struggle with. Completely absorbed in my workout and my game, the world melted away, and I often found myself adding on minutes to the original 30 just for a little more game time. 1 min walk. 1 min sprint. 1 min walk. 1 min sprint. 30 seconds back and forth between walking and sprinting until I reach 10 minutes. At that point, I go to a walk and increase the incline dramatically and then walk for an additional 20 minutes. I’ve seen some great results from this so far and highly recommend it! Hell, if running is too much, just do the walk at an incline. It super burns calories and is low impact on the knees. So how do I compete with boredom now? Well, now I watch anime on my phone during my workout. It’s distracting, but not so much so that I can’t focus on the workout at hand. Plus, it means I am constantly taking in new stories while working out and finding new ways to be inspired. I just finished up Yuri on Ice! and am now working through Sword Art Online. Have a suggestion of something awesome to watch? Let me know in the comments! I’ve also been using this time to make proper use of my Crunchyroll subscription so extra points if the show you recommend is on their roster. Weights are something that I am still working on getting better at. I now go to the gym 6 days a week and do a combination of weights and cardio (treadmill). Yet I am always learning and working on trying new machines or new exercises. Just like meal prep, it’s all about the sense of discovery and finding things that work for me! Before I wrap this up, I just want to mention weighing. Most sites will tell you to not focus on the scale. And they’re probably right. But I don’t listen. See, in the past, I would avoid the scale for weeks at a time, only to get on it and be disappointed which would set me back and make me give up. Now, I face that challenge head on. I actually weigh myself every morning and often times every night. I track the morning weight for changes. Once again, it’s about the fascination with learning. I want to know what makes my weight fluctuate. I want to see how that late night snack shows up that day in extra pounds or how that awesome workout shows results. The trick to this method is that you can never let the scale dictate how you feel about your weight. Okay, it might be more today, but that means you can adjust and work towards a better tomorrow. To me, that is so exciting. Also, do yourself a favor and get a digital scale. It is so much better than the old school and makes tracking progress much more doable. At the beginning of this article, it was January and I was 225 lbs. Now it is the beginning of August and I sit at 177 lbs. When I started, I set my goal at 165 lbs. and I’m almost there. Sure, I’ll probably adjust once I get there and set a new fitness goal for myself, but I am very proud of the progress I’ve made so far. No, it hasn’t been completely easy or overnight, but it’s given me a new appreciation of my body and how I care for it. I can’t imagine going back to before and I hope I never do. So that’s the journey so far. You should probably know that I’m crying as I write this because I just can’t believe how far we’ve both come. And the best part is that we still have so much of this journey ahead of us. I cannot wait to see where we are at in a month, six months or even a year!!! Writing this article was super fun and wonderful and sappy. I’d love to keep sharing tips and tricks that we’ve found useful so if you have any questions or things you’d like to hear more about in future articles, make sure to let me know in the comments below! I’d also love to hear your tips and tricks as well as life changing stories! Wow. That’s amazing! Congrats on the weight loss. Hope you continue it!!! Wow, well done Jayson! You and your mom look amazing!! I’m one of those ‘annoying’ people that loose weight easier than gain weight. After having had to go through a divorce earlier this year, I’ve really been struggling with that. Also not fun having to make sure you don’t get too much underweight. I think the key to keeping your weight healthy is to love yourself and focus on eating and exercising the way that is good for you personally. So not via a plan, but by knowing (and loving) yourself. And if you’re not there yet, start getting to know (and love) yourself. Just like you’ve been doing. You and your mom look very happy with Mickey and Minnie 🙂 Best wishes to you both on your journey. My husband and I just got off a seven day Disney cruise where everything was awesome, including the food!! During the cruise my husband worked with a fitness trainer who recommended a healthier eating plan and I am going “along for the ride”! I have really enjoyed your meal preps and weight loss journey and they have become a big encouragement and inspiration for me. A lifetime of weight struggle and “yo yo” dieting can be discouraging. My goal is to focus on getting healthy. Thanks for being such a great example!! That’s the best thing you can do. Don’t focus on a weight goal. Focus on feeling great and loving yourself. It makes all the difference! You and your mom look great! Thanks for the tips and the positivity. This is a wonderful post Jaysen, thanks for sharing, I’m only sorry it has taken this long for me to stop by. I haven’t been in a very good place and my blogging/reading has suffered as a consequence. I was always on the slim side – downright awkwardly skinny as a child – and I’ve never really felt negatively about my body in that respect. In the last year or two however I’ve seen myself put on weight. I think I was 10 stone the last time I weighed myself and I have a visible paunch that, for me, I’m just not used to and, I’ll be honest, ashamed of. I know my weight gain is the combination or poor diet and lack of exercise, as well as poor self care in general. I actually came here to see if you’d written anything about your meal prep routine as I’m looking to make drastic changes to my diet that I know would need the discipline you’ve shown. Your IG pictures always look SO good. My dad also has diabetes and, while he’s unfortunately less in control now, he did make big changes when he was first diagnosed and it’s inspiring to see your mum doing so well. It’s a lifelong illness but with the right approach you can life a full, healthy life. My dad also made the same mistake as your re. fruit: so much sugar! Thanks for sharing your story Jaysen and please continue to love yourself whatever your shape/size. You have so much to offer just by being you, and so long as you are happy in your own skin that’s all that really matters. I was always on the slim side – downright awkwardly skinny as a child – and I’ve never really felt negatively about my body in that respect. In the last year or two however I’ve seen myself put on weight. I think I was 10 stone the last time I weighed myself – the heaviest I’ve ever been – and I have a visible paunch that, for me, I’m just not used to and, I’ll be honest, ashamed of.